Getting started with twitter | Tax Accountant in Surrey, helping the self-employed. 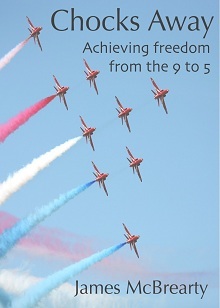 An excerpt from ‘Chocks Away: Achieving freedom from the 9 to 5’ by James McBrearty – published in 2010. This new phenomenon is a simple way of connecting with people easily, both existing friends and new contacts, by the sharing of short one hundred and forty character messages. One advantage of twitter is that you are limited to the size of a standard text message, which means that it is quick to use as you do not have to spend large amounts of time composing content. Another key advantage of twitter is that you can include links to other web locations and articles within the message, rather than try to condense what you are saying into a short message. Quite often I will see a blog or article on the web that is of interest to people and I will send out a short message saying why I like it and providing the link so that people can access it directly. With the one hundred and forty character limit there are many services online that can shorten links into a few characters so that you are not using up the whole message with the web address. Dell Computer has made over three million dollars directly attributable to Twitter. It is a quick and easy way to make connections with people and also to share information. Many websites now have a share button, such as at the bottom of my homepage taxhelp.uk.com – by including these on your website people are able to share your site very easily with a couple of mouse clicks, rather than having to copy the web address and then paste it into an email for example. By creating content online, that has value to people following you, you are creating greater interest in what you do and from that you will find that as a result people will want to find out more and the hits on your website will increase over time. You do have to ensure that you are providing information that is of interest and not just a different version of spam, where you constantly just try to get people to look at your site and don’t engage in conversations. You will hear various terms mentioned to do with Twitter; the main ones are below and fairly simple to understand. Note that tweets and retweets are shared with the web and that they can be found by anyone who happens to be using a search term that is contained within your message. This is also a powerful way to use twitter as you can search for key words that are of interest to you and then connect with people using them. If you keep your tweets to less than 100 characters, they can be easily retweeted by at least two other people. The retweet is powerful for two reasons. Firstly, your tweet is rebroadcast to other peoples’ followers. Secondly, as someone else is recommending you, it can come with more gravitas and authority. Also as Twitter search is real time you will get answers most closely related to what you are looking for. Whereas a web search may bring up articles and comments from months or years ago, a twitter search will bring up what people are talking about now which may only be minutes old. 5)	Download Tweetdeck for free on your computer, or an equivalent desktop program – it makes managing your account much easier. I also recommend Hootsuite. 6)	Regularly update – at least once a day. I tend to update at least 5-10 times a day. The last point is very important, so many people say ‘I’m on Twitter’ or ‘I have a Twitter account’ but unless you are updating at least once a day on average you really don’t actually have an effective account. When potential followers look at your twitter page they will look at the last time you updated to see if you are someone worth following. If you haven’t updated for several months then they are unlikely to want to follow you. You have to generate content for people first to have a chance for them to find you, which is your visibility. Creating content regularly will mean there is a greater chance of people reaching this stage. From then the process is whether they will be interested in what you are saying, your credibility. If you just keep repeating the same message as a type of spam then this is unlikely. However if you are generating useful content and linking to useful information then they may do. The final stage is whether they will be willing to do business with you, your profitability. This is the last stage of the process and can’t be rushed – you have to go through the other stages before you reach the stage of actually doing business. As to what I tweet about, when I started I may have been using twenty five percent business, twenty five percent social and half making connections by conversing with people. Again, it is not always just about business – people do business with people, and it is after all social networking. An example of this is one of the new clients that came through Twitter – not because of something tax related that I tweeted about; this was simply because a conversation had been started when I asked for film recommendations. I don’t have a rigid set of rules that says I only tweet in these proportions – it is me posting the messages on the account so I will respond as I see fit. It is very much up to the individual as to how they use twitter, this is a guideline but there are no set rules apart from spamming. Spamming, or ‘chumming’ as I heard Nick Tadd describe it is where people send you repeated impersonal sales messages. The great thing with twitter is that it is easily dealt with, offenders can be blocked and you won’t be contacted again.